ATLANTA, Georgia (CNN) -- Oscar Reynoso owed his bosses $300,000, and he was running out of time. One anti-drug operation in Atlanta netted $10.6 million, 108 kilos of cocaine, 17 pounds of meth and 32 weapons. Gunmen snatched Reynoso and locked him in the basement of a home to try to settle the drug debt. He was chained to a wall of the basement by his hands and ankles, gagged and beaten. His captors, members of a powerful Mexican drug cartel, held Reynoso for ransom, chained in the sweltering, dirty basement for six days without food. Reynoso's ordeal could've been a scene from the drug war in Mexico. But it played out recently in suburban Atlanta, Georgia. U.S. federal agents are fighting to keep that kind of violence from gripping Atlanta, as the city known for Coca-Cola and Delta Air Lines has become a major distribution hub for Mexican drug cartels. In fiscal year 2008, authorities confiscated about $70 million in drug-related cash in Atlanta, more than anywhere else in the United States, the Drug Enforcement Administration says. This fiscal year, Atlanta continues to outpace all other U.S. regions in such seizures, with $30 million confiscated so far. Next are Los Angeles, California, with about $19 million, and Chicago, Illinois, with $18 million. "There is definitely a center of this type of drug activity here, and we are working to make sure the violence does not spill out to the general public," Atlanta U.S. Attorney David Nahmias said. Atlanta has become a stopping point for truckloads of Mexican cocaine, heroin, marijuana and methamphetamine, agents say. 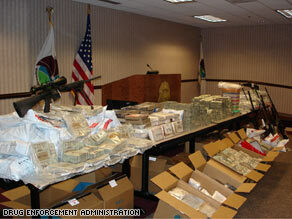 The drugs are held in stash houses before being distributed up the East Coast. "The money comes down here also to money managers in Atlanta, who get the books in order before it is sent out," said Rodney Benson, Atlanta's chief of the DEA. Agents attribute the growth in drug trafficking to Atlanta's location, proximity to other major cities and access to major highways. Authorities also point to the growth of the Hispanic population in Atlanta, which allows practitioners of the Mexican drug trade to blend in among hard-working, law-abiding Hispanics. No place is that more evident than in Gwinnett County, a community about 20 miles north of Atlanta. Gwinnett's Hispanic population rocketed from 8,470 in 1990 to 63,727 in 2000, according to the U.S. Census. By 2010, 20 percent of the county's projected population of 700,000 is expected to be Hispanic. "In Gwinnett County, the drug dealers are able to hide in plain sight," county District Attorney Danny Porter said. "To combat this, we have to be much more coordinated between my office, the police department and the federal authorities. The presence of the organizations is a dilemma enough that we have to develop new tactics." Federal agents say arrests and drug-related violence in Atlanta have been linked to the two most powerful Mexican organizations: the Sinaloa and Gulf cartels. A battle over drug routes has been blamed for the recent surge in violence in Mexican border towns, bloodshed that has included hundreds of deaths. The fear is that the battle will extend deeper into the United States, causing more to suffer a fate similar to Reynoso's ordeal in the Gwinnett County basement. Lucky for Reynoso, federal agents had a wiretap on his captors' phones. Agents stormed the home just as it appeared that the debt would not be paid and Reynoso would be killed. "There is no doubt in my mind that we saved his life that day," said the DEA's Benson. One case resolved, as cartels thrive in Atlanta.